ANATOMY OF A MISSION, FLAKPANZER IV VARIANTS IN 1/15 SCALE. 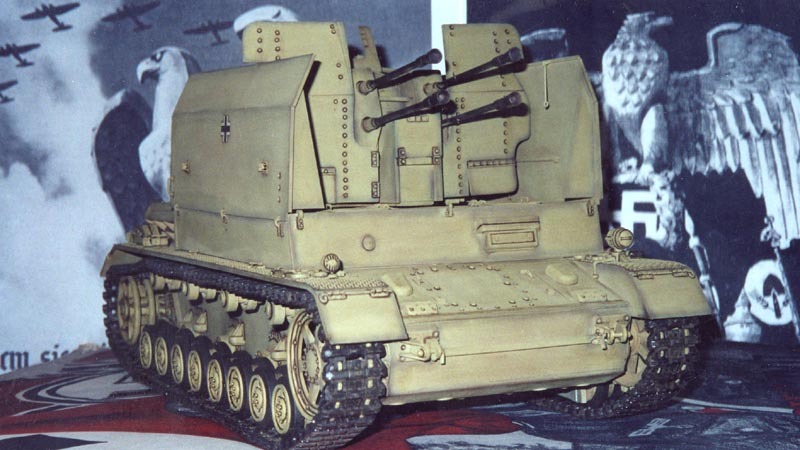 Flak caliber weapons at the beginning of the war were horse drawn or towed, what was needed was to have flak caliber weapons fully tracked and mobile, thus, the Flakpanzer was born and introduced. They had no choice, they had to defend themselves from the air, the allies were unleashing abominable air terror bombings and strafings indiscriminately, they had to respond to this threat. In the House of Commons an associated press dispatch reported that the allied air chiefs had made the �Long-awaited decision to adopt deliberate terror bombing of the great German population centers as a ruthless expedient to hasten Hitler�s doom�. The associated world press reported this widely published statement. This allied air offensive had been waged at a cost of nearly 160,000 allied airmen. 79,281 British, 79,265 American, it is a grim figure! The effectiveness of the bombings, as well as the morality of killing innocent German civilians, would be the subject of endless post-war debates. Despite this staggering loss of highly trained allied airmen, the bombers did not fulfill the dreams of the early prophets who had predicted that air-power alone could win a war, nor did bombing crack the German will to resist. The savage folly of these blind poundings and the numberless blastings of an unchecked allied air force hit the civilian population indiscriminately. The entire innocent civilian population were being reduced to pulp by the allied air force which was making the law of retaliation rebound on to innocent people. They were all matched by abominations of a type resembling those at the end of the world. Hundreds of thousands of woman and children were horribly carbonized on the direct orders of the allied Heads of State, which burnt them in their cellars with incendiaries and phosphorous fire bombs, and annihilated about two hundred thousand woman and children in one night in the gigantic crematory of Dresden. The word is used �about� because only an approximate estimate could be made by calculating the weight of the ashes! At that time the aerial terrorism bombings of the allies no longer even served a military purpose, since allied victory had been assured from the beginning of 1945, it no longer required this last dreadful pulping in any way, nonetheless, German Flak guns of all calibers threw up a deadly web of steel against the marauding allied air armada and the pesky soviet air force. The 2cm quadruple 20mm Flakvierling is the weapon believed to have shot down more allied aircraft more than any other Flak weapon, it was also used with deadly effect against ground targets.